Our mission and goal is to serve you by improving your business with high quality, easy to use products. We offer personal, around-the-clock service and are on call to help our client family satisfy their �families�. Making you and your business look good is our priority! We understand funeral care and its requirements. Serving funeral homes has been our focus for the past 13 years. We design and host exceptional websites at a very reasonable price, and provide beautiful and moving video memorial tributes. Many of the video tributes produced by Loving Honors feature music produced by The O'Neill Brothers. We receive so many requests for information on the music in our videos that we now are providing a link to the O'Neil Brothers web site. to view a sample video. We are proud to produce stunning video tributes for display during visitation and funerals. Upload the pictures, select a theme and music and the video is automatically downloaded onto your computer a few hours later. We carefully select video clips that match the selected theme, mood and color of the surrounding pictures. Click here for more information on our video tributes. 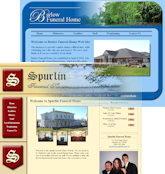 We custom design the web sites we produce. All pages, including the obituaries, guest book, and candles have the same unified look. Loving Videos� are immediately available for viewing through the obituary in your web site. You may choose to include flash movies or other animation to increase the visual impact of your website. We will work to provide the website you want. View some samples of our websites here, or click here for more on a Loving Honors designed web site.